We’d love your help. 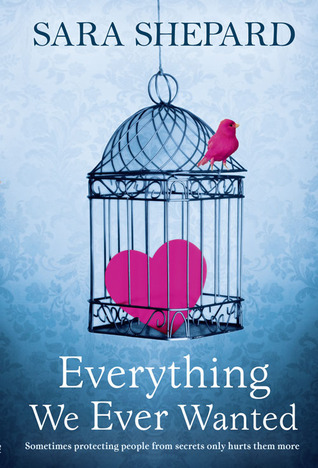 Let us know what’s wrong with this preview of Everything We Ever Wanted by Sara Shepard. A late-night phone call on a Sunday evening rarely brings good news. So when Sylvie, a recently-widowed mother of two, receives a call from the head teacher of the school she's on the board of, she knows it won't be something she wants to hear. To ask other readers questions about Everything We Ever Wanted, please sign up. Sylvie Bates-McAllister is a wealthy widow and mother of two grown sons. When she gets a phone call that her younger son Scott may be involved in a hazing scandal at the private school where he coaches wrestling and she is on the board, she and her family are thrown into a panic. I thought this book moved way too slowly and had a lot of moments that were supposed to be very dramatic that didn’t feel authentic to me. Everyone got worked up about the hazing scandal way too quickly – one phone call Sylvie Bates-McAllister is a wealthy widow and mother of two grown sons. When she gets a phone call that her younger son Scott may be involved in a hazing scandal at the private school where he coaches wrestling and she is on the board, she and her family are thrown into a panic. I thought this book moved way too slowly and had a lot of moments that were supposed to be very dramatic that didn’t feel authentic to me. Everyone got worked up about the hazing scandal way too quickly – one phone call and everyone went nuts without knowing any details at all – before any formal investigation or charges were brought. An autopsy on the boy that died hadn’t even been done. The characters were all very one-dimensional, especially Scott. Sylvie and her late husband adopted Scott when he was a toddler. He is biracial (African-American and white) and Sylvie and the rest of the family are white. Scott’s character is such a stereotype of the urban, angry black man that I was actually angry myself (at the author) as I was reading the book. I think (and hope) that the author’s intent was to show that he was more than that on the inside but that no one gets to know him well enough to figure that out. However, if that was indeed her intent, she did not do a very good job. The story took a weird turn about three-fourths of the way in and some of the storylines were just dropped with no resolution at all. The way Sylvie’s storyline ended was totally out of left field and left me scratching my head. Sara Shepard is also the author of the Pretty Little Liars series which I haven’t read but gather must be quite popular since it’s been made into a TV series. Only having read this particular book by Shepard, I can’t see myself reading any of her other books. Reading this insightful novel by Sara Shepard made me uncomfortable at times. The self-destructive behavior of some of her characters may hit a little close to home for some readers, and I think that many readers may recognize themselves in some of the characters. Sylvie is a wealthy recent widow, and mother to two grown sons: Charles, her birth son and Scott, adopted when he just a few years old. Charles always felt that he disappointed his father, that he wasn't the son his father wanted. Scott Reading this insightful novel by Sara Shepard made me uncomfortable at times. The self-destructive behavior of some of her characters may hit a little close to home for some readers, and I think that many readers may recognize themselves in some of the characters. Sylvie is a wealthy recent widow, and mother to two grown sons: Charles, her birth son and Scott, adopted when he just a few years old. Charles always felt that he disappointed his father, that he wasn't the son his father wanted. Scott is an angry, sullen young man whom everyone feels they have to tiptoe around lest they set him off. Charles recently married Joanna, a young woman from a different side of town, whose troubled mother is always visiting the ER complaining of various illnesses. Sylvie's grandfather ran a local boarding school for children from wealthy families. Sylvie adored her grandfather, even living in his home and serving on the board of the school. A scandal at the school involves Scott, who works as a wrestling coach. I found the fact that no one in Sylvie's family ever really communicated honestly with each other led to bad decisions, or worse, no decisions at all. I wanted to shake them all out of their stasis, yet at the same time, understood their reluctance to face their problems head on. It is a part of human nature we can all relate to. Shepard's characters are authentic and heartbreaking. She really gets into the nitty-gritty of what it means to be a newlywed, a mom, a widow, a son. The title of the book refers to what happens when you think you have everything you ever wanted: Joanna has Charles, whom she has dreamed of meeting since she was a young girl, Sylvie has her work at the school and her good, respected family name; Scott grew up in an intact, wealthy family with every monetary advantage; Charles has a lovely wife and a brand new house. But once you have everything you want, you may realize that it may not be everything you hoped it to be. This is a novel that will make you squirm a little bit, and maybe even encourage you to be a little more introspective about your own life. This is book is about a rich family that owns a very high up and expensive school. When the father dies of an aneurism the family is broken. When the father dies and they find out he was having an affair with his son's girlfriend the whole family is shocked. His brother was committed of hazing the kids on the wresting team at the school. When the whole family is accused and not wont speak up their mother Sylvie questions her son. What will happen to their family? Will they ever go back to their perfectness and at piece? Will they ever heal from the tragedies? When Sylvie Bates-McAllister, a recently-widowed mother of two, receives a late-night phone call from the prestigious school founded by her grandfather, her family is thrown into chaos. Her adopted son Scott may have been involved in a hazing scandal --and it may or may not have led to the death of one of the boys he coaches on the school team. Sylvie must decide between maintaining her outwardly perfect life --the family estate outside Philadelphia inherited from her grandfather, the school, the reputation --and the son who she feels wants nothing to do with her. For all the Bates-McAllisters, the phone call awakens questions lain dormant for years, revealing a tangled web of secrets that ties the family together: the mystery of the school hazing, Sylvie's deceased husband's locked filing cabinet, the event that tore Charles and Scott apart the night of their high school graduation, and the intended recipient of a certain bracelet. The quest to push past a legacy of resentment and judgments to unravel the truth takes the family on individual journeys across state lines, into hospitals, through the Pennsylvania woods, and face-to-face with the question: what if the life you always planned for, and dreamed of, isn't what you want at all? One thing I always like to do is figure out why a book has been giving its name. It took me a while to figure out where the title came from. It actually took me to the end of the book. To tell you, would be giving the book away and I want you to read it instead. I could not quite figure out the plot to this book. I guess I was looking for a complicated plot when it became apparent to me that I was looking for something that was not there; the plot was simple. The book is about a family that struggles through life, something we all do. It is about how we do the best we can through each phase of our lives. The book is about how we make mistakes. It is about how we say things we wish we could take back; the way we do things we wish we hadn’t. The book is about how we do things to get the attention of those we love. It is a story about how complicated relationships can be; those haunting memories of what could have been; should have been. It is about what finally breaks us; what finally allow us to either connect or disconnect with people. It is only when we peel away the layers of the past that we clearly see the present and begin the future, thus fulfilling our destiny. The only disappointment in the book for me was the ending. The ending left you with the impression that all works out, but I would have liked that extra chapter; I am a closer. I am giving this book two thumbs up (that is all I have) and would highly recommend reading it. Sara Shepard graduated from New York University and has an MFA in Creative Writing from Brooklyn College. The author of the bestselling young adult series, Pretty Little Liarsand The Lying Game, as well as the adult novel, The Visibles, she currently lives outside Philadelphia, Pennsylvania with her husband and dogs. This book is set for release in October 2011. I've never read any of the PRETTY LITTLE LIARS series, but when I saw this Sara Shepard novel, intended for adult audiences, I was definitely intrigued -- even when the description on the back sounded a little less than enticing, I admit. The plot revolves around Sylvie, a widow and a prominent lady of society. She has two sons; Charles, who is married to Joanna, and Scott, who was adopted and never quite fit into the lives of the "upper crust" family. When the novel opens, Sylvie has learned that I've never read any of the PRETTY LITTLE LIARS series, but when I saw this Sara Shepard novel, intended for adult audiences, I was definitely intrigued -- even when the description on the back sounded a little less than enticing, I admit. When the novel opens, Sylvie has learned that a child Scott coached on the wrestling team has died, and the suspected cause is hazing. Scott is in a process of investigation, as he is accused of having been aware of the hazing and allegedly did nothing to stop it -- before leading to a probable case of murder. The story alternates between the perspectives of Sylvia, Joanna, Scott, and Charles, often in random, confusing manners without explanation of the time or events that have passed between. The reader learns that one tragic event dissolved the bond between Scott and Charles, Charles and his ex-girlfriend, Sylvie and her (now deceased) husband, as well as the boys and their (now deceased) father. Each knows tiny bits of the story, but none quite communicate enough for anyone to really understand the impacts of what happened. Unfortunately, the event is neither climatic nor unpredictable, and the characters really do nothing with the information they hold. The story jumps too much between characters and events, without any meaningful cohesion, and the ending just didn't leave me fulfilled or glad in any way to have finished this chore of a novel. As many of you know I am a fan of Sara Shepard. I have read every book she has written and enjoyed them all. She is mostly known for being a YA author who has written the wildly popular Pretty Little Liars series and the newer series The Lying Game. Both series are now shows on ABC Family. Pretty Little Liars is about to wrap of their second season and The Lying Game has just begun this summer. Both of which I am hooked on. But she also has written two books outside the YA arena; The Visibles an As many of you know I am a fan of Sara Shepard. I have read every book she has written and enjoyed them all. She is mostly known for being a YA author who has written the wildly popular Pretty Little Liars series and the newer series The Lying Game. Both series are now shows on ABC Family. Pretty Little Liars is about to wrap of their second season and The Lying Game has just begun this summer. Both of which I am hooked on. But she also has written two books outside the YA arena; The Visibles and Everything We Have Ever Wanted. My review today is about Everything We Have Ever Wanted. I was able to read a galley of the book through Net Galley. I just love that Shepard can fill my craving for juicy, page turning YA, as well as mature, thought provoking novels. Everything We Have Ever Wanted has a multifaceted story about family, history and love. About forging ahead after great and deep disappointment. I felt emotional tired after reading because I felt for the characters and their struggles. Sometimes things cannot be simply fixed, as is with life. Everything We Have Ever Wanted will not disappoint. This book never took off for me. The whole time I was reading it I was irritated by all the characters, not because they were horrible people (but they were) but because they were all so flatly drawn. Everyone was one note and almost a caricature: sheltered, slightly racist old WASPy white lady; gold-digging young wife who is rethinking what she has "won," and her pill-popping drunk mom, mealy-mouthed WASP son who has had life handed to him, bullying old dad, and the worst of all, a multiracial This book never took off for me. The whole time I was reading it I was irritated by all the characters, not because they were horrible people (but they were) but because they were all so flatly drawn. Everyone was one note and almost a caricature: sheltered, slightly racist old WASPy white lady; gold-digging young wife who is rethinking what she has "won," and her pill-popping drunk mom, mealy-mouthed WASP son who has had life handed to him, bullying old dad, and the worst of all, a multiracial kid adopted into this wealthy WASP family who is a "thug." This review has been hidden because it contains spoilers. To view it, click here. I absolutely love Sara Shepard, so it pains me to give this book only 2 stars, but I just never really connected to it. It should have been a win for me - a possible murder in a hazing gone wrong, family secrets, plenty of intrigue - but it just fell flat. Really flat. Like, pancake flat. Flat like a pancake that was run over by a semi. The characters - I had a hard time connecting to them, and their respective storylines were never resolved. What happened between Charles and Joanna after he tell I absolutely love Sara Shepard, so it pains me to give this book only 2 stars, but I just never really connected to it. The characters - I had a hard time connecting to them, and their respective storylines were never resolved. What happened between Charles and Joanna after he tells her the truth about meeting up with his ex Bronwyn and she confesses that she kissed his brother? No idea, it was ever addressed. What happened to Sylvie when she learned that Bronwyn was having an emotional affair (?) with her husband? Don’t know, it was never explained. What about Scott’s involvement with the hazing ritual? Well, it turned out the kid that died was a jerk to everyone and died of a virus...which was really flat for me because the whole “was it an accident or murder” was the plot line I was the most interested in. The story - was very convoluted and the most interesting parts seemed to be glossed over. Like, yeah, oh by the way, Scott moved from Pennsylvania to Arizona to find his birth parents and ends up getting a woman pregnant and not finding anything about his family. And then the book ends. There’s no reunion between Scott and his family. Now, before I begin, I have a confession to make. It's a confession that may shock some of you. I have to admit that before reading Everything We Ever Wanted I had never read a Sara Shepard novel. Before you all start throwing things at me, I promise that I will be reading her others novels, especially her Pretty Little Liars series. So, therefore as soon as I had the opportunity to review Everything We Ever Wanted I jumped at the chance. After all I just had to see for myself the reasons why everyone is so in love with her novels. The characters within Everything We Ever Wanted experience a wide range of emotions that as a reader I was swept along with and able to feel with each character. Sylvie, Joanna, Charles and Scott are each going through inner turmoil for different reasons, and this added real depth to each character. While I did want to find out what happened to each characters life I did think that it was very difficult to relate to and actually like any of the characters. Sylvie in particular seemed a little cold and self centered at times, which lead me to dislike her until late on in the novel. I did enjoy the way Sara Shepard is able to dig into the depths of each character and really get into how everyone deals with their roles as, mother, wife, son etc. This book was my first novel by Sara Shepard that i've read, and was really excited to read it, but was let down. I felt that the storyline was all over the place and wish it focused on one main issue instead of having a million different issues being highlighted. Sylvie Bates-McAllister is a recent widow with two sons, one of which is biological (Charlie) while the other is a mixed boy that was adopted (Scott). Sylvie recieves a phone call from the well-known prep school that her grandfather founded that a boy was found dead and they believed it was a suicide due to hazing being comminted by members of the school wrestling team, which her adopted son, Scott coaches. This book focuses on many issues, and many of which are important issues, but personally I wish the story focused more on the hazing and assumed suicide of the student, which is what I thought the book was primarly about, but so many more issues are involved in this book, adultery, racial issues, secret pasts, etc. It was a decent story, but just a bit of a miss for me. I felt like nothing was coming to play because the story was all over the place and so many smaller issues were being discussed rather then that main issue at hand. I'm interested to read Sara Shepard's YA series, Pretty Little Liars and the Lying Games, and because I've heard so many good things about this series, I think maybe Sara Shepard's voice is that of a YA author and less of an Adult Fiction writer, and maybe her YA books will be more enjoyed by me! This review has been hidden because it contains spoilers. To view it, click here. Starting reading this book on holiday, as I really like the author so thought I’m sure I’ll like this one. Heard really great reviews about it and hadn’t seen too many bad ones. Unfortunately I didn’t rate this at all. I thought this was a really poor book. It bored me throughout the whole book, apart from the middle, it got a tiny bit exciting….then it went back downhill again. I don’t think the story line was very great. Maybe it’s just because I’m so used to there being heaps of drama is Sara Starting reading this book on holiday, as I really like the author so thought I’m sure I’ll like this one. Heard really great reviews about it and hadn’t seen too many bad ones. Unfortunately I didn’t rate this at all. I thought this was a really poor book. It bored me throughout the whole book, apart from the middle, it got a tiny bit exciting….then it went back downhill again. I don’t think the story line was very great. Maybe it’s just because I’m so used to there being heaps of drama is Sara Shepards books, but this one was not filled with as much drama. It didn’t go into enough detail , felt like I was guessing who each character was, and there seemed to be too many drama’s. Scott was being accused of something, another person was cheating, Sylvie kept thinking of her husbands death, another couple weren’t happy. This book didn’t stick in my mind and I doubt I’ll be able to remember the story that well either. Probably wouldn’t be on my high list of books to recommend. To be honest, I expected more out of this title. Everything We Ever Wanted was little more than a paperback romance, but it tried to be deeper. The rich Bates-McAllisters' lives have suddenly become more complicated: Scott (the grown-up adopted son) may have been involved in hazing that caused the death of a high school student. Sylvie (the matriarch)belongs to the school board, and now has to deal with the scandel and shame of what Scott did (or did not...we don't know). Charles (the uptight ol To be honest, I expected more out of this title. Everything We Ever Wanted was little more than a paperback romance, but it tried to be deeper. The rich Bates-McAllisters' lives have suddenly become more complicated: Scott (the grown-up adopted son) may have been involved in hazing that caused the death of a high school student. Sylvie (the matriarch)belongs to the school board, and now has to deal with the scandel and shame of what Scott did (or did not...we don't know). Charles (the uptight older brother)is unhappy in both his work and marriage and still dealing with his dead father's lack of love and affection. Joanne (Charles' wife) is unhappy and confused about which McAllister brother she really loves. Does that sound like a soap opera? It's how the book read. Though Sara Shepard's writing was not bad, per se, it wasn't engaging. Was this a great novel? No. Was this a really good novel? Maybe not. However, I couldn't put it down. The story may be maudlin, the characters may be clueless, but it didn't matter. It kept my interest and kept me reading. Maybe it's a pretty good novel after all. Sara Shepard usually writes young adult. "Everything we Ever Wanted" is targeted to grownups. The Bates-McAllistars are a wealthy family with so much history it stifles them. Mom has designed the house as a shrine to her grandfather. He Was this a great novel? No. Was this a really good novel? Maybe not. However, I couldn't put it down. The story may be maudlin, the characters may be clueless, but it didn't matter. It kept my interest and kept me reading. Maybe it's a pretty good novel after all. Sara Shepard usually writes young adult. "Everything we Ever Wanted" is targeted to grownups. The Bates-McAllistars are a wealthy family with so much history it stifles them. Mom has designed the house as a shrine to her grandfather. Her sons have grown up with a seething rivalry they've never dealt with. If everyone in the family would just TALK to each other, there wouldn't be a problem but the last thing these people can do is communicate. I cannot imagine a world that I had everything that I wanted and needed, but spent so much of my time being angry, or sad or alone. Each of the family members in this story had secrets, and hidden upset that kept them from connecting to one another. So much internal sadness and longing for something. If they would only talk and share! I could feel the tension and restraint in how the spoke or didn't speak to one another. Finally things begin to change and each of them begins to grow and heal in their own ways. Borrowed this one from the library. I usually like Sara Shepard's books, but this one fell flat. The story was decent, but the ending wrapped up way to quickly for how the rest of the story dragged out. And parts of it really really seemed to jump around a bit, and make little sense. I will continue with her books, but she's got a way to go if she wants to successfully target the audience she was going after in this particular novel. Ok read. I have a hard time reading characters that can't seem to ask obvious questions. Conversations that needed to be had, were not and so the story line moved very slowly. Characters seemed to be muddling thru life. I also don't like story lines where characters quit one thing in life and go on to another so easily-difficult to believe. I want to start off saying i loved the pretty little liars series. So when i saw a new book was coming out by the same author i was excited. But i read 20% of this book and that was enough torture. It did pass the time, but i do not care at all what happens to want to finish reading this book. Sorry but it is 2 thumbs down from me. I've been in a love/hate relationship with this author for 10 years. Granted, I was only reading her young adult novels. It was only a couple day ago that I found out about her more adult novels. I was expecting nothing but thrillers from her so I was very pleasantly surprised to read this one and realized how much variety she was capable of. So now she is for sure one of my favorite authors! Terrible book. I had to force myself through this one for book club but it was painful. The characters are boring and whiney. Could not connect with anything about this story. Every page I found my self sighing or drifting off to daydream about something else entirely. It's rare for me to really hate a book but this one made that list. I really felt annoyed the entire way through this book. Each character was completely unrealistic and annoying. The storyline was repetitive and reams of it was peppered unnecessary detail. My eyes have never rolled as much as when I read this book. I didn’t care much for this book. None of the characters were endearing or even likable. Not one family member ever told the truth about anything. They all just assumed things that most of the time were not accurate. I was aggravated with every character throughout the book. This took me so long to read because I kept reading similar books and would have to set it aside as not to get the plots twisted. I think had I read it alone (or with fewer books) and uninterrupted I would have given it a higher score. and it was an interesting read - one that I enjoyed but didn't love. The secrets were interesting to weave through but I just didn't feel the pull or connection to the characters that I'd hoped. I absolutely adore Sara Shepard, but this book was one of the most boring things I've read in a long time! Sara Shepard graduated from NYU and has an MFA from Brooklyn College. She has lived in New York City, Brooklyn, Tucson, Arizona, Philadelphia, and now lives in Pittsburgh, PA. Sara's Pretty Little Liars novels were inspired by her upbringing in Philadelphia's Main Line.